Even among the host of new smartphones we've seen launched in 2019, the Sony Xperia 1 stands out from the crowd – perhaps because of that elongated 21:9 aspect ratio, 4K resolution screen. So how does this sleek new handset compare with its predecessor? The Sony Xperia XZ3 is pretty much the phone that the Xperia 1 replaces, though they're both still on sale (and Sony's mobile line-up can be difficult to make sense of). Here we'll compare the phones in all the key areas so you know how they stack up against each other. Sony has managed to resist some of the design trends that have dominated the smartphone market in the last couple of years – like notches and ultra-thin bezels – but the Xperia 1 shows it slowly inching towards a more modern look for its phones. The top and bottom chins are bigger than you will find on a lot of other flagships this year, but overall the device is sleek and very presentable, and we like the arrangement of the triple-lens camera on the back. The 6.5-inch, 1644 x 3840 pixel resolution OLED screen looks fantastic, meanwhile, whether in portrait or landscape orientation. As for the Xperia XZ3, it's another fine-looking phone, but it's not quite as fine-looking as the Xperia 1. The bezels are bigger, the 6-inch, 1440 x 2880 pixel resolution OLED screen isn't quite as impressive, and it's also a little thicker. We like the look of both these handsets but we have to say the Sony Xperia 1 edges it. You can pick up the Xperia 1 in black, grey, purple or white, while the Sony Xperia XZ3 is available in black, white, green and red. We've talked about the 4K, 21:9 aspect ratio screen of the Sony Xperia 1, but there's a lot more going on here. Under the hood you've got a top-end Snapdragon 855 processor, 6GB of RAM, and either 64GB or 128GB of internal storage. There's a memory card slot too, so you can add up to 512GB of storage on top. Those specs match up with the other Android flagships of 2019, while the Sony Xperia XZ3 matches up with the Android flagships of 2018: you've got the previous generation Snapdragon 845 processor, 4GB of RAM, and 64GB of internal storage. Again, there's a memory card slot available to boost the storage by up to 512GB if needed. You can clearly see that the Sony Xperia 1 is more powerful than the Sony Xperia XZ3, but the older phone won't let you down in the performance stakes – if you can find it at a decent price on your travels then it might represent better value for money for you than the newer model. In terms of intensive gaming, or running multiple apps at once, or playing high-definition video, both these handsets will serve you perfectly well. If you already own the Xperia XZ3, there's not going to be a huge leap forward in performance if you upgrade to the Xperia 1. Sony has always done mobile photography well, and both the triple-lens 12MP+12MP+12MP rear camera on the Xperia 1 and the single-lens 19MP rear camera on the Xperia XZ3 are capable of getting some great shots. Those extra lenses on the Xperia 1 do give you more options to play around with – like 2x optical zoom. Both these phones offer IP68 waterproofing and dustproofing, so they can survive 30 minutes in liquid up to a depth of 1.5 metres (nearly 5 feet). Both come with fast charging capabilities too, but only the Xperia XZ3 brings wireless charging with it – perhaps one reason to go for the older handset. In terms of software, both the Sony Xperia 1 and the Sony Xperia XZ3 come with Sony's take on Android 9 Pie on board, so there's nothing to split them there. Let's hope they both get a speedy upgrade to Android Q as well, when the time comes. It's really that cinema-style screen that makes the Sony Xperia 1 stand out, rather than any of the other features, so if that takes your fancy then the upgrade is worth it over the Xperia XZ3. Also, it moves the fingerprint sensor from the back to the power button, which we think is a little more convenient. 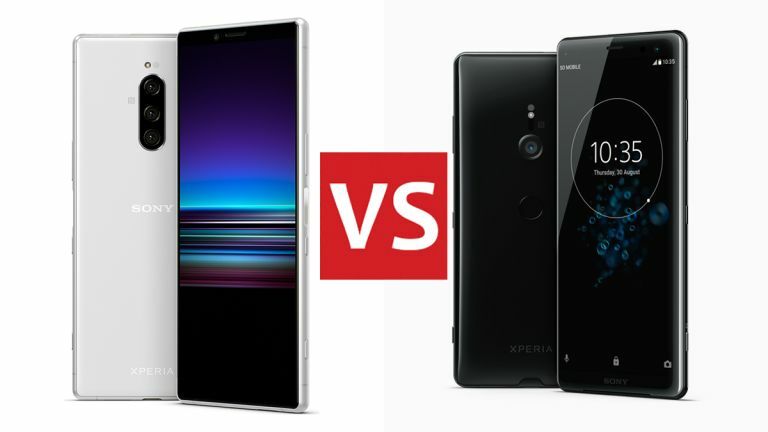 If you're choosing between these two phones, the newer Xperia 1 beats the older Xperia XZ3 in several areas – like the screen, and the camera – but you'll have to check the latest prices to decide whether you think those extras are worth it. The Xperia XZ3 is still a capable phone even in 2019. If you've already got the Xperia XZ3 and are thinking of upgrading, it's probably only worth it if you think you're really going to make use of that improved screen. The jump in performance and camera quality won't be massive, but hey, if you've got the cash then don't let us put you off. Both phones borrow some of the Bravia tech that comes inside Sony's TVs, and both phones look and feel great in the hand. Both have support for HDR content from the likes of Netflix as well, so picking the Xperia XZ3 isn't necessarily going to be a massive step down for you. As always, it's a balance of price, power and features – the widgets on this page should tell you exactly how much you'll have to spend on the Sony Xperia 1 or the Sony Xperia XZ3 at the moment, so you can make your choice accordingly. We always like the latest and shiniest gadgets, so we'd go for the Sony Xperia 1.